Fragmentation of man into areas over which various groups struggle appears to be nonsensical... Harmony can come to pass only when each special interest group realizes that it cannot have a monopoly over a particular area of the nature of man. This article is written by Joel Bennett, PhD, by invitation from the staff at National Wellness Institute (NWI). And this invitation is now extended to all others— to you — to share your own ideas, truths, or opinion. To submit your own article or blog, or respond to this one, please do so here. Your voice matters! Let us pause right there. This is an invitation. In its truest form, well-being is and has always been an invitation to wholeness. The National Wellness Institute was founded in 1977 on the basis of this invitation to wholeness. Every conference has invited wellness students, professionals, friends (and often, family) to show up BOTH as a professional and as a person seeking health, renewal, and community. This invitation to wholeness – combining professional advancement with personal growth – is unparalleled in a field that is increasingly subject to forces of fragmentation. Indeed, a hallmark of NWI’s identity is inclusiveness both within (self) and without (community). We can forget this most simple and basic truth: that well-being is and has always been an invitation to wholeness. We cannot force, cajole, incentivize, or otherwise manipulate someone to be well. We can, instead, set up the conditions, role model, inspire, and compassionately guide or nudge others to get in touch with their own sense of wholeness. When we treat wellness as a commercial endeavor, a product, or a commodity, we communicate — often unwittingly — that an external agent will fix things (i.e., outside of us: a pill, a regimen, a diet, an app). This “romance of the fix or the rescue” is quite compelling, given great strides in the sciences of treatment, medicine and pharmacology. These are wonderful advances; many have been helped and lives have been saved as a result. At the same time, these sciences can tend to reduce human beings to those parts – biological, psychological, etc. — that are the targets of treatment. As a result, we often end up with a fragmented view of our human being. Wholeness is left behind. The NWI staff invitation came after the 2017 facilitated “Key Note” presentation and workshop I helped with, titled “The Audacity of Wholeness: Self-reflection and Dialogue in Six Dimensions”. You can download the entire slide-deck for this presentation here. You can access the audio presentation through the NWI conference store, here. The Audacity of Wellness presentation product code is 201714156. It Starts with Story. At a primal level, the invitation to wholeness is really an invitation to tell, embrace, and share in the story of our own becoming. In the 2017 key-note facilitation, we emphasized the dual importance of personal story and tribal authenticity. I was honored to hear other NWI members present a part of their own very personal journeys toward wholeness. These co-presenters were Hailey Hoepner, Michele Mariscal, Emily Brainerd, Lisa Medley, and Danielle Burrell. They spoke about intimacy, grief, overcoming perfection, dealing with the trauma of racism, and embracing the wisdom of mind-body-soulfulness. Again, you can listen to them here. The bottom line message of this work is this: Our story cannot be separate from the challenges that surround us. We absolutely need to stop talking AT each other and start sharing with each other. Our healing starts with sharing stories in a safe community that honors wholeness and inclusiveness. And this invitation is also one to have fun in the process. Our previous past President, Meg Jordan, shared about this as well (see here). The Root of the NWI Story. I believe that the break from wholeness is a break from our deep, ancestral roots and from the natural recognition that humanity is one living and evolving unity. And that, really, we are all — alone and together — being sent an INVITATION to recover and redeem that wholeness. Imagine that you are being sent this invitation now. Remember. All three of these words have the same etymological root: Holy, Whole, and Health. In the old English (Halig, Hǽlþ, Hal). Over the past 40 years, this common root, this vibration, or tri-source fountain has helped drive the growth and evolution of the National Wellness Institute and conference. Without my even asking, over the years that I have been coming to the conference, I will hear different participants tell me. Of course, not everyone says this. But, there is something in the genetics of NWI that gives rise to this experience of coming home. How NWI is Evolving. From my limited perspective, with the data I have at hand, I believe that the National Wellness Institute has evolved—or, rather, is evolving—across five different phases. I call them phases rather than stages because I believe that NWI is still evolving, mutating, organically moving forward and backward and is currently faced with many challenges. But this is what it means to be healthy: organic, resilient, changeable, vital, open. During the facilitated key-note, participants were asked to complete the wholeness exercise AND share their experience with others. Both steps (internal reflection and safe sharing) are key. As part of this exercise, participants watched this message from Howie Mandel. Please feel free to share these instructions with others. Phase 1: The Foundation - Embracing the Six Dimensions. With the six dimensions of wellness — Physical, Intellectual, Emotional, Occupational, Spiritual, Social – NWI established the call to personal and professional wholeness as an integral part of its mission and identity. Despite the wider culture’s tendency to associate wellness with the physical (often cardiovascular health and fitness), NWI said we are so much more than just physical health and, also, that each aspect influences other aspects. Now that is audacious! This means that some people join NWI for one aspect — often to learn new science around fitness — and come to realize that emotions or soulfulness or intimacy are a lot more important than their previous learning allowed. More often, they knew this all along. They just needed permission to bring their full self into the framework (haven?) of a professional conference. Phase 3:Inclusion - Embracing Multi-Cultural Values. How can one be whole in a society that promotes prejudice, racism, and discrimination? As NWI has evolved from a foundation of multi-dimensional wellness to multi-dimensional community, I think it sent a strong message that attracted wellness professionals from many different races, ethnicities, gender identities, cultures, and nationalities. And from this message, NWI has grown its own Multicultural Competency Committee, with sessions, webinars, and conference tracks helping us to recognize the importance of inclusion. The Multicultural Wellness Wheel© was branded by NWI in 2016. This tool is a vibrant map of our humanity and a device to help us remember who we might otherwise forget in our broader wellness efforts. Phase 4: Intimacy - Empowering Membership. In 2015 and 2016, NWI launched an extensive national survey of wellness professionals (members and non-members) with the help of staff member, Christina Petersen, and myself. As we dug into the data, we learned that one of the key drivers of interest in NWI is networking and connections, even local geographical connections. While the conference has been a mainstay “space” where people first meet, many people continue to meet, network, and enjoy long-term professional friendships outside of the conference. In other words, the conference as an event is really just a manifestation of a deeper need to have intimacy and connection. 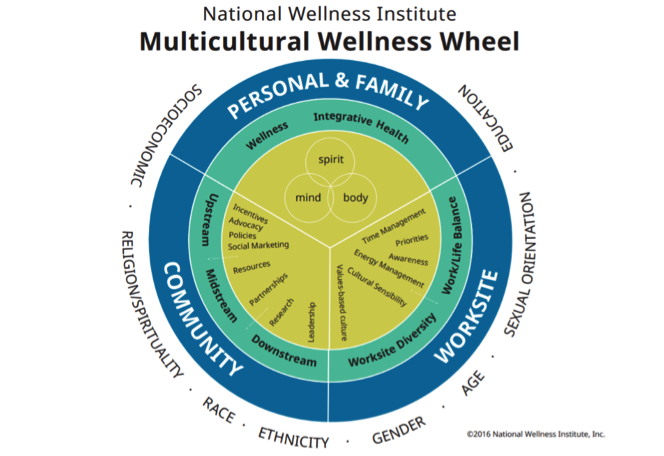 It is apparent that wellness professionals really understand both the social aspect (of the six dimensions) and the community aspect (of the Multicultural Wellness Wheel©) of wellness. They seek to embody this as NWI members who move toward thriving at social levels. As a result of this survey, last year we launched “The Wellness Connect” as a way for members and friends to get together locally. Below are some example of this and we just had our first event internationally in the Phillippines, with Marco Escareal. Instead, what if THE INVITATION was encouraging us to evolve. What if we were really evolving into some system that represents wholeness to the rest of the world, and attracts like-minded learners/seekers who: a) wish to master their craft, b) embody personal wholeness through their work (livelihood), and c) merge these together. At one-level, NWI can be seen as a resting place for a “meta-society” of wellness or well-being change agents who really get that their professional work and personal transformation have to go hand-in-hand. This idea is not new. The idea that a society could evolve that would reflect on itself in order to promote truth, goodness, health, and beauty has been called The New Humanity (Meher Baba), A Meta-society (Oscar Ichazo), Integral Society or Panarchy (e.g., Ken Wilber), or — in the Jewish Tradition Tikkun Olam, which translates as kindness performed to perfect or repair the world (supporting social policies and social justice). Of course, all of the ideas above mean nothing without authentic dialogue and authentic action. And authenticity only emerges as a result of an invitation. I hope that as you review the ideas, links, exercises, videos that you reflect on these thoughts: What am I being invited to? Or What if all of this was an invitation to me to deepen into my more authentic, whole self? Or What am I being called to serve? If NWI stands for anything, it stands for the freedom to come to these answers on your own, in your own time, and through your own learning. That is what NWI is here for. To provide you with ongoing, top quality learning. And — guess what?... remember Phase 4 (EMPOWERED membership)? If you are not getting that, you better let NWI know. Contact Sherri Galle-Teske, Director of Membership and Engagement, at Sherri@nationalwellness.org. You can email me at owls@organizationalwellness.com. Go inward and tune in to what you need to know and do. And, if it is right, please share with the rest of us. That is how we will evolve. Joel Bennett, PhD, is President of Organizational Wellness & Learning Systems (OWLS), a consulting firm that specializes in evidence-based wellness and e-learning technologies to promote organizational health and employee well-being. Dr. Bennett first delivered stress management programming in 1985 and OWLS programs have since reached close to 50,000 workers across the United States and abroad. He is primary developer of “Team Awareness” and “Team Resilience,” evidence-based, culture of health programs recognized by the U.S. Dept. of Health as effective in reducing employee behavioral risks. Team Awareness has been adapted by the U.S. National Guard as one of their flagship prevention programs and it has been used by municipalities, hospitals, restaurants, electrician training centers, small businesses, Native American tribal government, and in Italy and South Africa.